Cable & Kane team-up in an attempt to defeat Stryfe and the MLF, while flashbacks detail Cable's history with the Six Pack and Stryfe. Issue #1: A decade ago, the Wild Pack, led by Cable, completes their first mission for Tolliver. In the present, Cable stops the Mutant Liberation Front from stealing an ancient sword bearing the likeness of Apocalypse. In Canada, Bridge shows Kane footage of Cable attacking the MLF. 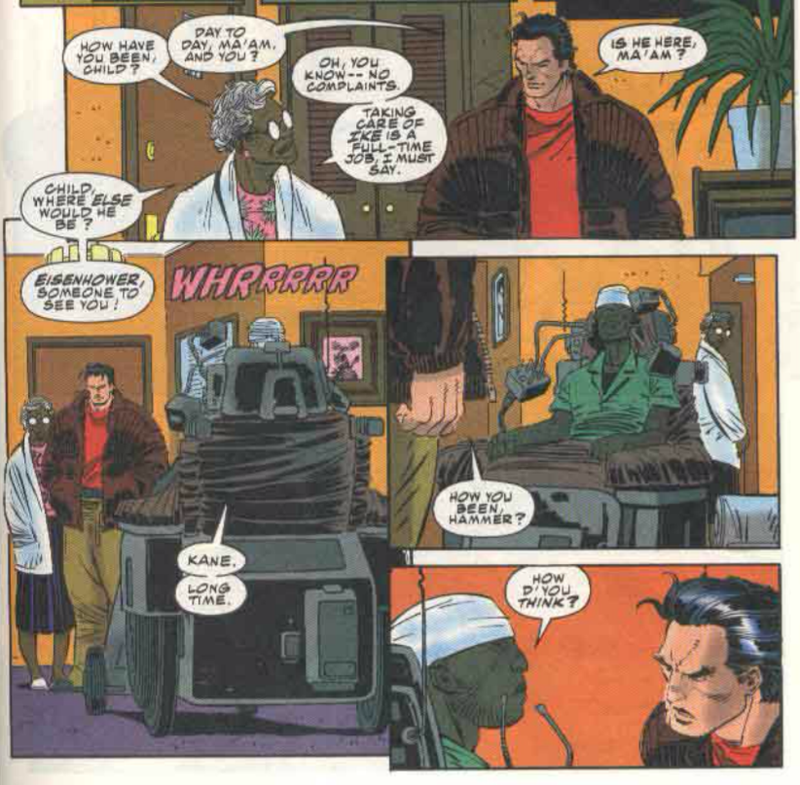 Confused, Kane agrees to hunt him down, and proceeds to visit their old teammate Hammer for a list of Cable's safe houses. Meanwhile, Cable learns there are a variety of artifacts baring Apocalypse's likeness, and is able to be on hand when the MLF try to steal the next one, but he gets no closer to Stryfe. In the past, the re-named Six Pack are on a mission in Afghanistan when they discover a secret base of Stryfe's. In the present, Kane attacks Cable at his Swiss safe house. 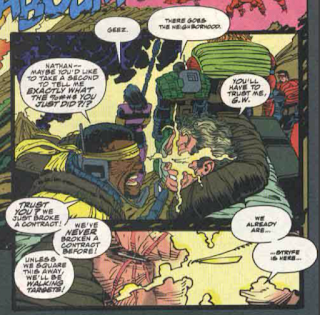 The two fight, and when Cable gets the upper hand, he demands to know why Kane is after him. In response, Kane shows him the recording of his encounter with Stryfe, revealing to Cable that Stryfe shares his face. Issue #2: Working together, Kane & Cable infiltrate the ancestral Yashida home, and strike a deal with Silver Samurai to place a tracker on the Apocalypse artifact in their possession, a Shogun mask, in the hopes of following it back to Stryfe. In the past, a terrified Cable teleports the Six Pack out of Stryfe's base.In the present, Stryfe is told the stolen mask is a fake, and is shown the tracer. In the past, the Six Pack grows increasingly frustrated as Cable grows obsessed with hunting Stryfe. 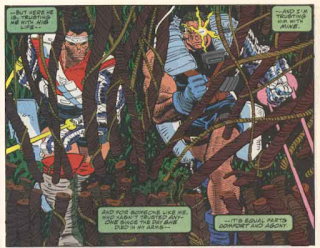 In the present, Cable & Kane follow the tracer to a temple in the Yucatan jungle, where Stryfe & the MLF are waiting. In the past, the Six Pack infiltrate another base of Stryfe's and download a cache of information regarding his activities. But Stryfe arrives and takes Kane hostage, demanding the disc with the stolen information. Cable refuses, and when Hammer tries to give Stryfe the disc, he shoots Hammer, paralyzing him. Cable teleports away, abandoning the Six Pack. In the present, Cable is faced with a similar choice, as Stryfe demands the data-link to Professor, Cable's computer, in exchange for Kane's life. 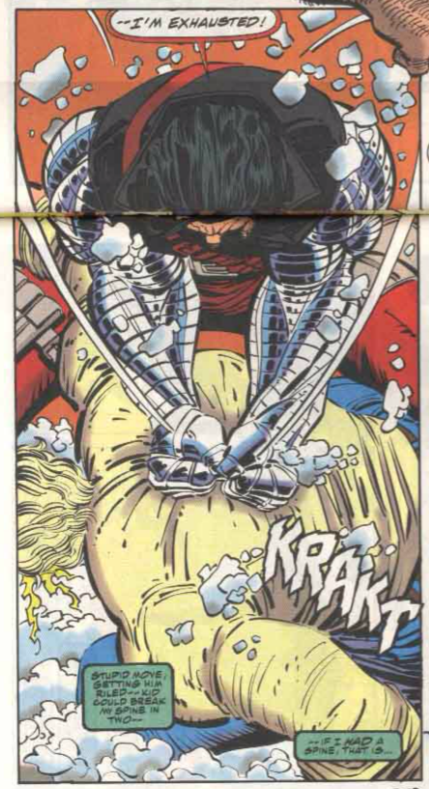 Cable agrees, but when Stryfe releases Kane, he destroys the link, and an enraged Stryfe savagely attacks Cable & Kane. 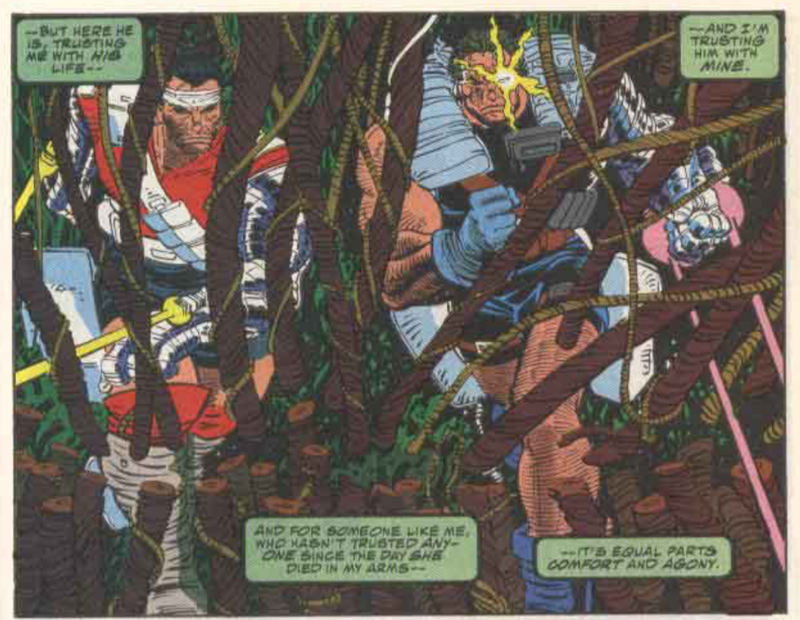 The pair escape when Cable timeslides them into the future, where he's able to heal Kane's injuries, assuring him that despite Stryfe's escape, if had to do it all again, he'd make the same choice to save Kane. In general, this story serves as a lead-in to "X-Cutioner's Song", bridging the gap between Cable's appearance in X-Force #15 and that story, teasing the connection between Cable & Styrfe, and continuing Stryfe's evolution away from a generic mutant terrorist villain and towards a villain with a more personal connection to the X-Men and a larger connection to the larger X-narrative, which "X-Cutioner's Song" will, in turn, fully realize. Specifically, Stryfe's connection to Apocalypse is teased here, through Stryfe's quest to retrieve artifacts bearing his likeness (seen also in X-Men), and in his present day encounter with Cable, he states is now prepared for what's to come (presumably a reference to the attack he will launch in "X-Cutioner's Song"). Issue #1 establishes that Cable previously was unaware that Stryfe shared his face; issue #2, in turn, has the pair meeting face-to-face, literally, for the first time (something I never really considered before: it will eventually be established that Stryfe is a clone of Cable, unafflicted by Cable's techno-organic virus, yet in this issue (and previous ones), Stryfe's face is drawn to have similar scars to Cable's, which, he really shouldn't have - he was cloned when Cable was an infant, before he had any scars. 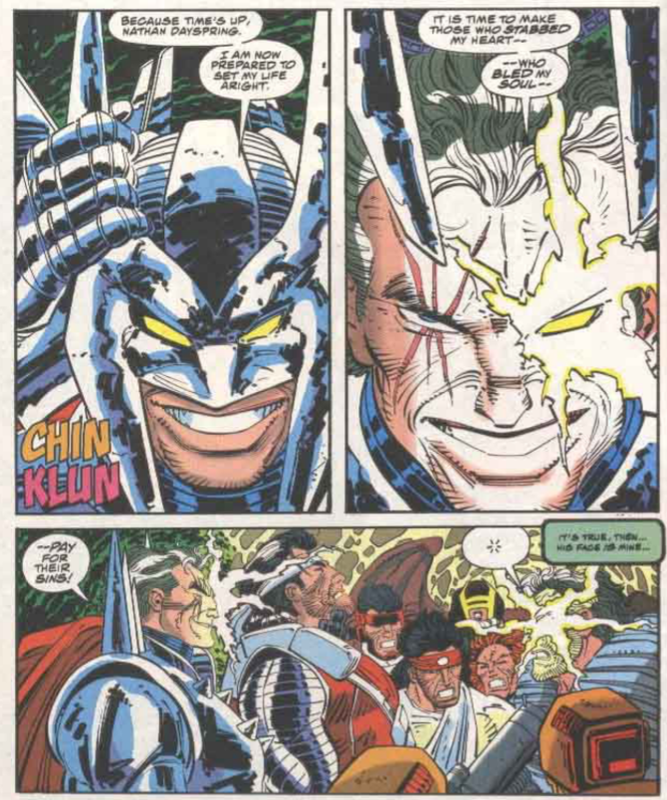 Later stories, after their relationship was hammered out, usually give Stryfe a "clean" face). 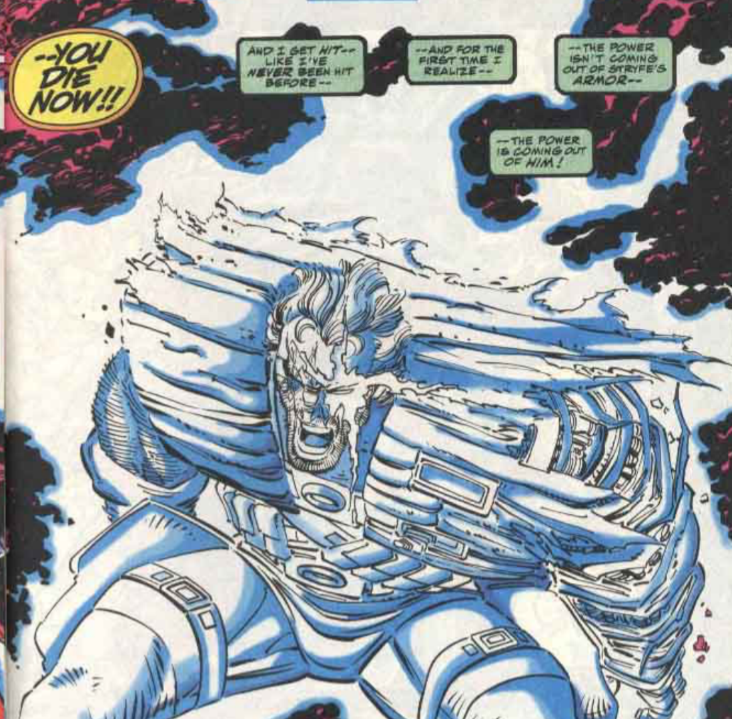 Though ultimately Stryfe is established as being the clone of Cable, initially, the idea in the X-office was that Cable was the clone and Stryfe Cyclop's son. 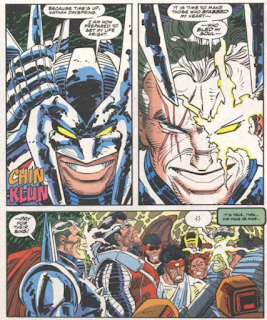 Much of "X-Cutioner's Song" is written with that idea in mind (though most of the hints in that direction come from Stryfe, so it's easy enough to say "Stryfe thought he was the original"), and a clue to it is found in issue #2, when Cable thinks that Stryfe is "more of me than I am of him". This story reveals Cable's full name, Nathan Dayspring Askani'son, a name that clearly hints at him being Cyclops' son, given that baby Nathan was taken to the future by a woman named Askani (who will eventually be revealed to be one member of a larger order of people called the Askani) in X-Factor #68. Another clue to Cable's identity comes when Stryfe demands Professor, Cable's sentient computer that runs his space station, in exchange for Kane's life. 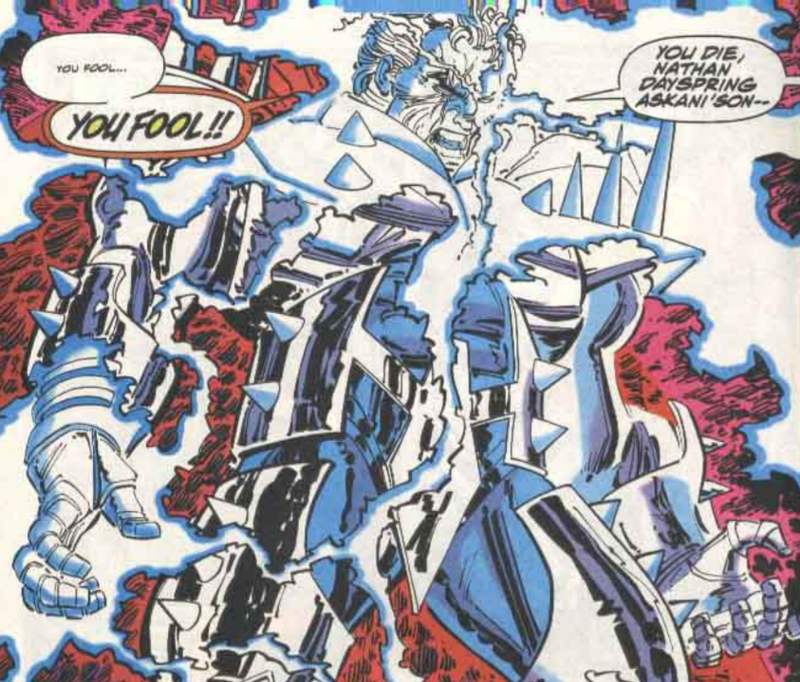 Stryfe wants it because Apocalypse once possessed it, suggesting that Professor is Ship, and thus that Cable is Baby Nathan, since what was left of Ship's consciousness went to the future with Nathan as well. 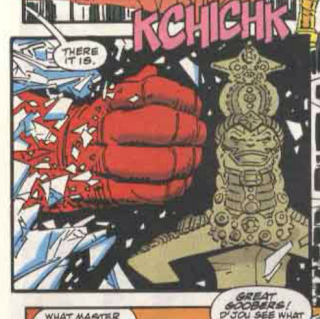 It's also revealed, to both readers and Cable, that Stryfe's power is his own, and doesn't come from his armor. He's also shown to be vastly more powerful than Cable (this is later explained as Cable constantly devoting a measure of his power to hold back the techno-organic virus, whereas Stryfe, without the disease, can use his full power however he pleases). Issue #2 more or less confirms that it was Stryfe, operating without his armor or helmet and thus looking no different than Cable, who killed Rictor's father (remember, Rictor's real last name is, ahem, Richter), thus triggering all of Rictor's animosity towards Cable (though this revelation doesn't quite fit with how the Rictor/Cable relationship was first presented in New Mutants - "he killed my dad!" probably would have inspired a different immediate reaction beyond "simmering resentment"). 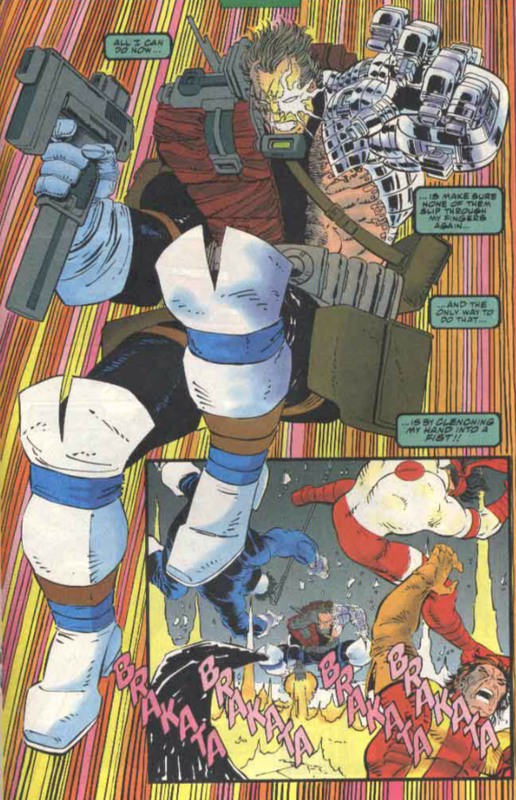 Cable's pre-X-Force mercenary group, comprised of himself, Domino, Bridge, Kane, Hammer and Grizzly, is shown to have renamed themselves from the Wild Pack to the Six Pack at some point in the past, due to threats of legal action by the Symkarian government, a nod to the fact that Marvel was, at this time, publishing Silver Sable and the Wild Pack, whose characters operated out of the nation of Symkaria, and that Nicieza was probably told he couldn't use "Wild Pack" as the name for Cable's old group. Hammer, the one member of the Six Pack yet to appear in the present day (just in the flashback of X-Force #8), does so in issue #1, where it's revealed that he's paraplegic. Issue #2, in turn, reveals that Cable was responsible for crippling him by shooting him in the back to stop Hammer from trading valuable data to Stryfe in exchange for Kane's life, which is the source of much of the enmity shown towards Cable by Kane and Bridge in the early issues of X-Force. Rusty and Skids appear here as members of the MLF, actually interacting with other members while on a mission for the first time. In the wake of his defeat by X-Force, Kane gets a new look in issue #1. It will, of course, be made into an action figure. 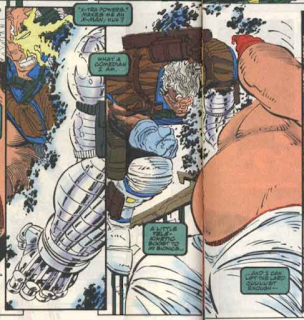 This series ends with Cable & Kane in the future, with Cable having helped heal Kane from Stryfe's attack on him. Cable will be seen returning to the present in "X-Cutioner's Song", while Kane will remain in the future for the early issues of Cable's ongoing series. MLF member Sumo is killed by Cable in issue #1. The logo used for these issues will carry over as the initial logo of Cable's ongoing series. Both of these issues feature a wraparound cover, and are double-sized, costing $2.50 each. John Romita Jr., a few months away from returning to Uncanny X-Men, draws both of these issues. Rob Liefeld and Louise Simonson get a "created by" credit for Cable in both issues. 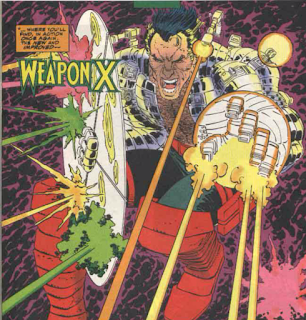 Cable appears here after X-Force #15, and before his first actual appearance in "X-Cutioner's Song" in X-Men #14, with a few appearances in Marvel UK titles occurring before this story and after X-Force #15. Rusty & Skids appear here between New Mutants #100 and X-Men #13. Though he was killed in X-Force #15, Tolliver looms large over this story. We see the Six Pack's first job for him, and learn why started targeting Cable (which will later be retconned when his identity is revealed) as well as the fact that he and Stryfe worked together. The sword stolen by the MLF for Stryfe, featuring an image of Apocalypse on the hilt, will appear again in "X-Cutioner's Song". 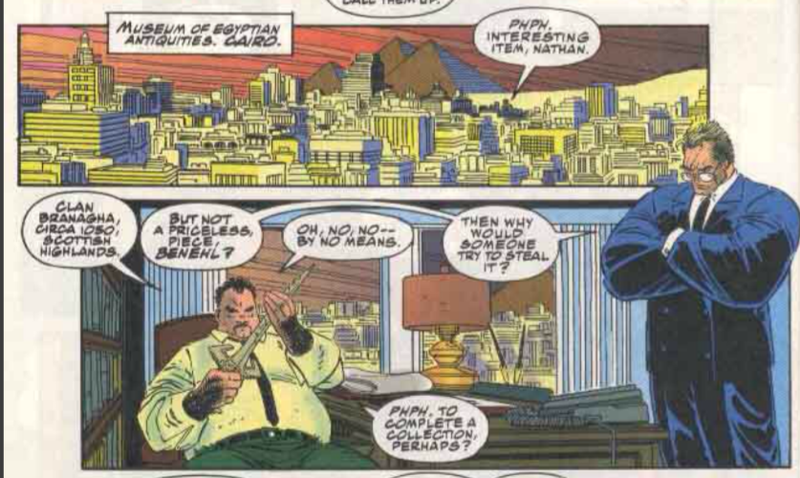 Similarly, issue #1 establishes that there are a variety of historical artifacts scattered around the world that seem to bear a likeness to Apocalypse on them somehow, which Stryfe is sending the MLF to acquire (Rusty and Skids having retrieved one such piece in X-Men #13). For some reason, Zero appears to be wearing a hooded cloak at one point. At one point during Cable's second encounter with the MLF in issue #1, Nicieza seems to lose track of who is present, as Cable refers to Kamikaze despite him not being present (he probably means Samurai, who is part of that particular group). The running gag of Reaper always losing a limb continues here, as Cable blasts off the cybernetic hand he received as a replacement for the one Shatterstar cut off in X-Force #1. 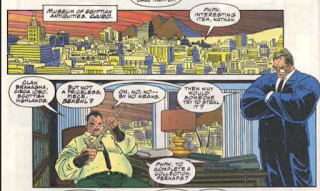 Tolliver's Austrian villa, where he was holding the real Domino and the site of his death in X-Force #15, appears in a flashback. It's where the Six Pack adopt their new name. One of the Apocalypse artifacts is in the possession of the Yashida family, leading Cable to visit their ancestral home, acknowledge the recent death of Mariko, and briefly fight Silver Samurai. Cable notes that the members of the MLF are relatively young, something that wasn't always apparent in their earlier appearances (in part because all those Liefeld lines made them look older), but which later writers will emphasize a bit more, and which helps strengthen the thematic connection between the MLF and X-Force (making both the youngish groups of mutants arrayed against each other by Cable and Stryfe). In addition to crippling Hammer, Cable presumably pissed off the rest of the Six Pack by time-jumping himself away afterwards, leaving the rest behind, and the story seems to be suggesting this was the last time the Six Pack saw Cable before the events of X-Force (though he must have made up with Domino sometime between this and New Mutants #98/whenever the real Domino was captured by Tolliver). When Cable takes Kane into the future, he says that Manhattan is now known as Applecrust, though I don't believe that name is ever used outside this series. There's also a statue of what is clearly meant to Apocalypse; later stories set in Cable's timeline will establish that Apocalypse more or less reigns supreme in that time. Somewhat curiously, Nicieza ties a couple of the Six Pack's flashback missions to specific historical events. The initial flashback, set "ten years" seems to reference the Iranian hostage crisis (given that this issue is on sale in 1992 and the hostages were released in January of 1981, that "ten years" must be general and not specific. Later, their mission in the Khyber Pass in Afghanistan seems to take place during the Soviet-Afghan War, both of which make the presence of the Six Pack's Kirby-esque weaponry seem all the more incongruous in a way they don't in stories set in the "present". 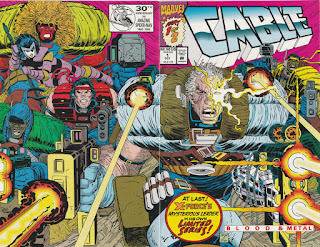 The third Cable action figure made by Toy Biz will match Cable as he appears in this splash page, right down to the Romita Jr. KirbyTech gun. In both encounters with Stryfe across two time periods, the villain tries bargaining Kane's life for data stored on a disc. Cable's mutant power is specifically referred to as telekinesis for the first time in issue #1 (he'd previously been seen levitating objects, but it wasn't clear if he was using telekinesis or magnetism at the time). As in New Mutants #99, there's something inherently funny about seeing Cable in a suit and wearing glasses. This series introduces the notion that Cable has a variety of safe houses sprinkled around the world, and shows us one in Switzerland, which he calls his favorite. It will make occasional appearances in future stories. At the safe house, Cable is attended by at least one of his named-after-the-original-X-Men robots, introduced in X-Force #8. At one point Cable suggests via thought bubble that he physically has no spine, which doesn't really turn out to be true. Thanks to another thought bubble, Cable declares he's had a hard time trusting people "since she died"; this is presumably a reference to Jenskot, whom we'll eventually learn is his wife, though the circumstances of her death as later presented really shouldn't be responsible for instilling a lack of trust in Cable. 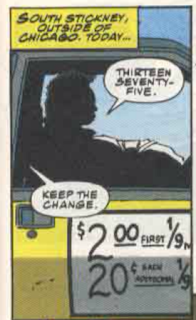 Romita shows the passage of time in a cool way, drawing the side of a waiting cab with the fares listed on it as the last panel in a flashback, then essentially redrawing the same panel, but with different, higher fares, as the next consecutive panel, as the story returns to the present. Of course, it's all rendered moot by narrative captions that spell out the time shift, but a cool device nonetheless. I have a lot of affection for this miniseries - it's just, big, dumb, loud, fun, featuring some big, loud fun artwork from John Romita Jr. at the height of his "wide, chunky figures and crazy weird futuristic guns" phase. There's tons of double page splashes (both horizontal and vertical) crackling with Romita Energy Effects, but they're backed up by the fact that Romita can actually lay out a page and tell a story in the non-splash panels, and by each issue being double-sized (so the extra big splashes don't make the issues read a lot faster by eating up pages). It also helps that everything is bright and boldly colored, making it feel very comic book-y; Cable is an inherently-ridiculous character, and leaning into that skid, rather than trying to portray him as grimly realistic, works to the story's advantage, especially at this point in Cable's history. The end result is something that seems, artistically, in keeping with the traditional Liefeldian depictions of the character, but which is far more readable. Meanwhile, Nicieza continues the yeoman's work of crafting some kind of character for Cable out of the Frankensteinian assortment of tropes and types and cliches Liefeld used to cobble him together. Nobody really cares about the relationship between Kane & Cable (even Nicieza will more or less drop it after the first few issues of Cable's ongoing), but it does a lot to at least humanize Cable, following up on his later, post-Liefeld, appearances in X-Force where he started to show some level of affection for his teammates. The multiple time periods also provide an opportunity to show some character growth, both in the obvious (the climaxes to the plots in both the past and the present very obviously mimic one another, showing how present day Cable approaches a similar dilemma to his past self) and the more subtle (Past Cable is a lot more devil-may-care, seemingly content operating as a mercenary with his friends, until he runs into Stryfe for the first time, after which he becomes darkly obsessed with hunting him down at the cost of his friendships). Drawing meaning by running a character's past and present in parallel isn't the most clever of devices, but again, this is Cable we're dealing with: when it comes to characterization, there's a low bar to clear. Cable also comes across far more human here than he has yet to it in New Mutants or X-Force. He seems legitimately freaked out when he encounters Stryfe for the first time (in the story's past), and in the present, seems genuinely sorry for how things have turned out with Kane (we may not care about Kane, but it helps that at least the central character of the story does). And the reveal that Cable didn't know Stryfe shared his face, either, is a great twist; it puts the reader ahead of the character, further engendering sympathy in him, and puts him at a power disadvantage (since this is information Stryfe has obviously possessed much longer), thus adding an additional layer to their relationship and deepening their conflict beyond the previously-established vague animosity and shared history as the characters head into "X-Cutioner's Song" (which still doesn't really get around to answering the questions about Cable & Stryfe's relationship raised or repeated here, but that's not really this series' fault). Ultimately, Cable, as presented in this story, reads very much like the beginning of the character who will eventually carry his own series for over a hundred issues while becoming a more integrated part of the larger X-narrative, someone who, if not exactly straightforward in origin or terribly original in concept (and, at times, execution), is at least well-rounded enough to be at the center of stories. 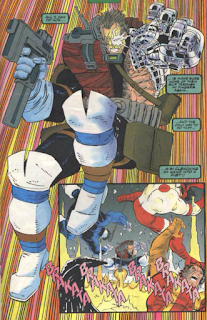 Cable was born as a collection of (now hideously dated) cliches, but Niceiza is gradually shoring up or moving past those cliches by developing an actual character for Cable (he does actually care about some people, he can be darkly comic, and is capable of self-reflection and personal growth). Nobody will ever mistake these two issues for high art, nor would anyone (including me) try to argue that they are, but for a story featuring a relatively cardboard lead character and forced to serve many different masters (continue the efforts to make Cable a workable character, tie off some of the lingering mysteries surrounding him, and setup "X-Cutioner's Song"), this manages to serve those masters while being surprisingly fun and entertaining. Tomorrow, Excalibur battles back against Jamie Braddock & Sat-yr-9 in Excalibur #56. Next week, "X-Cutioner's Song" begins in Uncanny X-Men #294. Now is the moment in which my comments will become increasing annoying. For me, when Jim Lee leaves, is when X-Men are done. Not because of him, but because I feel that they were never the same and the stories became more and more confusing and boring. Having said that, I never liked the idea that Cable is Christopher. Doesn't add anything and I wonder who thought that Cyclops having two adult children around him was a good idea. Finally, I wonder why no one went crazy with all the heavy emphasis on Cable during those years. He was everywhere. Everywhere. Cable overdoses even for Cable fans. I didn't dislike him, I actually didn't care at all about him. For me, the News Mutants as I knew where dead. The X-Force weren't them. Regarding Cable, the only thing that really bothered me was that everyone knew him already, even though we readers had never seen the meeting. I was a huge Cable fan back in the day, when these issues were first released, so I definitely didn't feel overwhelmed by him. And being an even bigger Cyclops' fan, I loved Cable turning out to be Nathan Christopher - to me, it connected one of my favorite characters to my all time favorite character. Before going to do any work to educate me on the matter further, I always thought Kamikaze and Samurai were the one and same character. 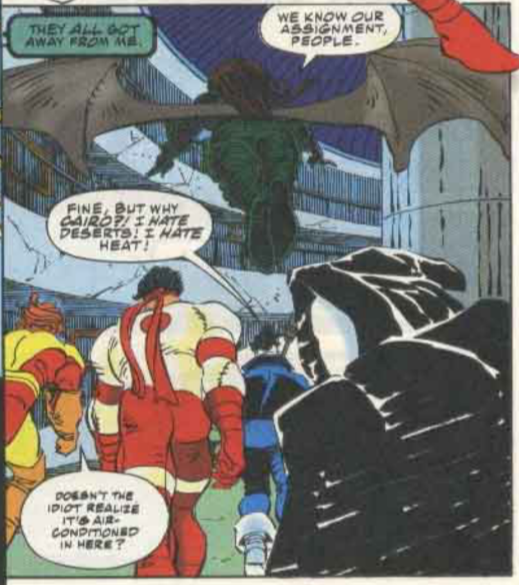 Kamikaze was a non-non-noticeable enough in his NEW MUTANTS debut with Dragoness and Sumo (and never reading an issue of X-FORCE) to assume that this very similarl-themed and -looking character was just going through a Kitty/Ariel/Sprite type of reinvention of himself. They really had a Kamikaze AND a Samurai? Gosh. And will immediately return with the scythe installed right into the cybernetic arm within these two issues. ... and upon checking it up, yes, there is but one guy in MLF with the Japan-themed costume, known to us as 'Kamikaze' from the pages of NM, but referred here as 'Samurai' by Dragoness in the blurb and Cable in the boxed text. Of course, 'samurai' and 'kamikaze' are both the kind of derogatory terms one could use of a Japanese male person in these of surroundings, so maybe it's just that Cable has the latest intel and bad attitude.... which would probably be a direct lift from Liefeld's initial notes anyway. Though by the third chapter of "X-Cutioner's Song", he's back to two hands. So it seems. Good, though. I think a scythe-inna-hand is pretty much the silliest gimmick a super can have, and it's not helped one bit by there being the pre-existing Avengers villain Grim Reaper. I think Cable's Switzerland safehouse even made an appearance in Nicieza's CABLE AND DEADPOOL several years ago. I've never read this series. Cable didn't do much for me as a kid, and I was only just getting into the X-Men when it was released, so I never bothered to seek it out as back issues. But based on your review, it actually sounds like a lot of fun. I know I have it in a trade or an Omnibus or something -- I should check it out. 2. Has the bizarre coincidence of Cable's late wife's name being a butchered portmanteau of "Jean" and "Scott" ever been addressed? @Matt- yes, it was explained that she took that name to honor the legendary foes of Apocalypse. Yeah, I'm pretty sure the Swiss safehouse was in CABLE/DEADPOOL. Nicieza peppered that series with references and callbacks like that (which is one of the things I loved about it). And yeah, Applecrust is...weird. I get the idea that's it supposed to be a derivative of "The Big Apple", but it just doesn't sound like a name people would ever give a city. Ohhh...! I hadn't made the connection between "Big Apple" and "Applecrust". Still bizarre, but at least there's a reason behind it. Thanks, Anonymous! I assumed Jenskot had to have been explained at some point, but you never know. I freely admit that I have a very, very soft spot for the X-books in 1993 after the Image exodus (1994 is a different matter) so it comes as no shock that I loved this mini-series, warts and all. I adored Romita Jr.s artwork from that period-it felt like he channeled Kirby for a while there-and it really suited this story well. It's a bit of a mess because Nicieza's having to make the scattershot hints about Cable into something coherent, but the art was why I bought it back then and it holds up a LOT better than most early 90s X-Books do now. Good stuff. Yay, another Romita Jr. fan! I'm glad you mentioned the Kirby-channeling; I get a lot of that too. JRjr's energy effects, in particular, always remind me of the Kirby Krackle. "Stryfe's face is drawn to have similar scars to Cable's, which, he really shouldn't have - he was cloned when Cable was an infant, before he had any scars. 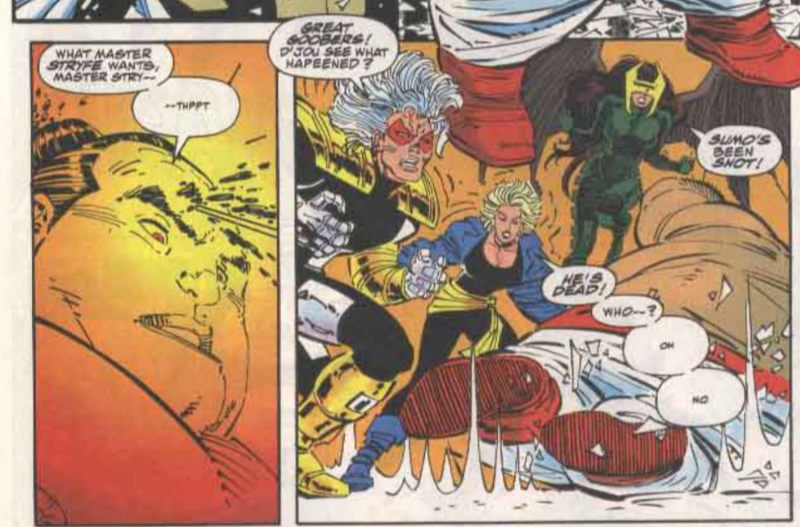 Later stories, after their relationship was hammered out, usually give Stryfe a "clean" face)." Not only does he have scars, but if you look very carefully at the scene of him dressing in issue 2, he seems to have bionic parts. Nicieza tried to explain the identical scars by saying that even though Stryfe was cloned without the virus, he still had some of the scars from the Virus that Nate did- which makes no sense. Issue 2 came out 3 months late. 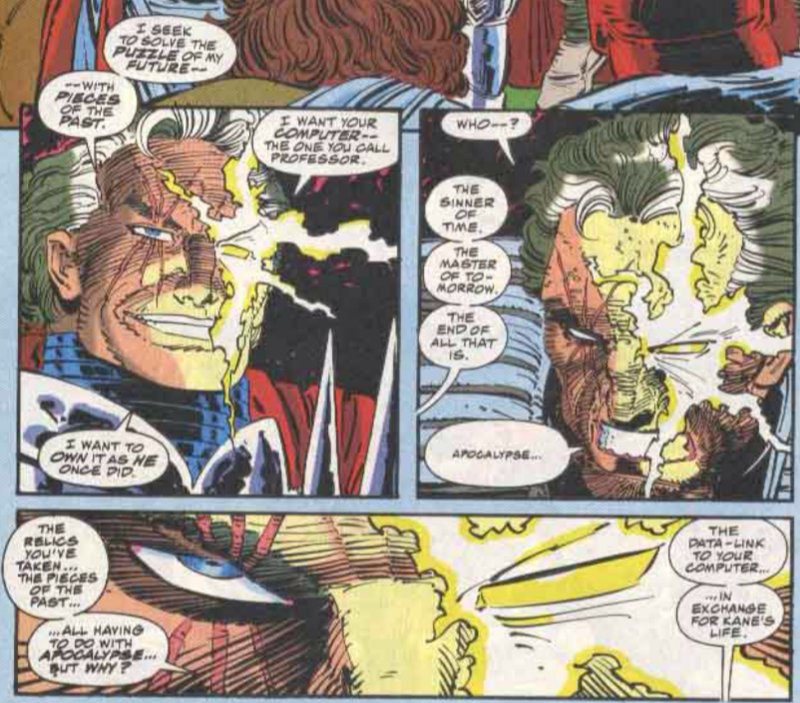 I'm willing to chalk up the apparent bionics to Stryfe wanting to impersonate Cable (I presume that's what he's doing when he meets w/Richter, though that's informed by the fact that Rictor believed Cable killed his dad for all those years), but the scars are definitely weird. Do you have a good source for when books shipped late? I know issue #2 was notorious for being late (in part because it came out after "X-Cutioner's Song" started) but I didn't know exactly how late. We're entering into a period in which lots of notable issues ship late, but I never know quite how to determine exactly when. Mike's Amazing World, my main source for cover dates/ship dates, usually goes with the intended ship date rather than the actual one. If issue 2 shipped three months late, that would explain why, for years and years and years, I thought this entire series was released after "X-Cutioner's Song"! Until only about two years or so ago, I had been under the assumption it was a follow-up to the crossover, explaining what Cable was up to before his return in "Fatal Attractions". Sorry, no I don't have a good source. One good way to tell is to look at the Bullpen Bulletins and check the books that were Shipping this Week. Usually, they listed the books that came out the date the book actually shipped, although it was sometimes a week behind. Unfortunately, that doesn't work for a book that doesn't have Bullpen Bulletins, like Cable 2. Hover over the magnifying glass next to the on-sale date on #2’s page at Mike’s and you see an outlier date of December 4th amid the September dates. The source appears to be something like info from Capital City Distribution as shared on Usenet. Unfortunately, Chuck LePage’s ComicList only popped up in 1995, because its searchable database comes in handy. If you can zero in on the issue you’re looking for, which may be tricky sometimes, you’ll get hits for the week it was originally supposed to ship and (when applicable, due to lateness) every following week it was expected to ship, with its last appearance presumably the week it finally did (unless it ended up canceled). My experience is that it’s certainly not ideal in a vacuum but definitely a helpful part of a balanced approach to detective work on release dates. 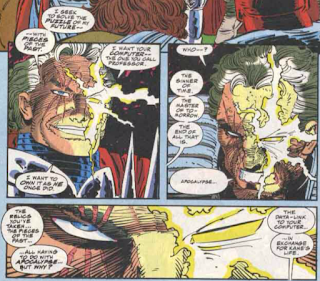 No but really, why is Stryfe's eye the focal point in his use of power (and Nate Grey's later on)? Cable was supposed to have a bionic eye that gleams with the Longshot-like effect, but these other guys so much shouldn't. Is it because daddy got eye-beams and momma telekinesis? I have always chalked it up to the Cyclops thing. 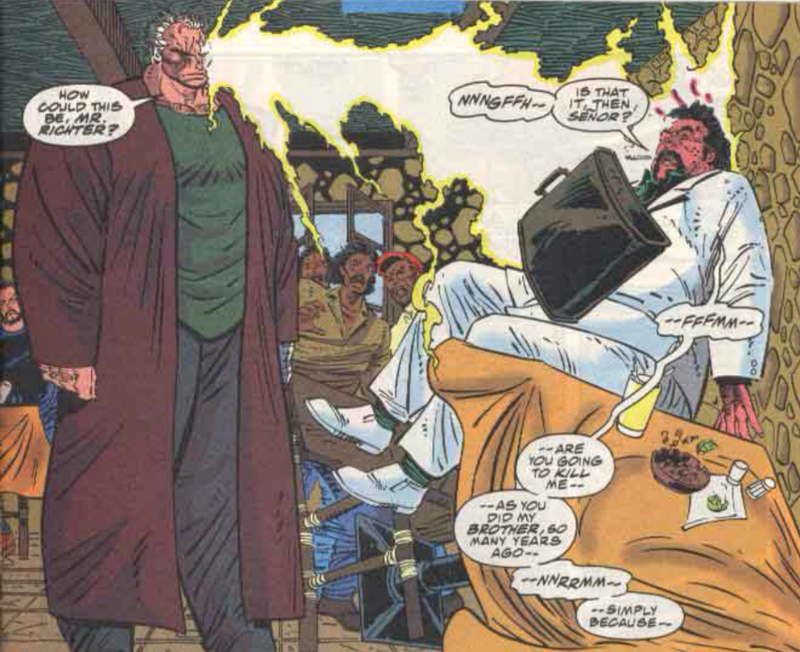 Though of course, in "reality", I believe, no one in-universe sees anything when a character uses telekinesis. Like when we see Jean Grey in a movie; stuff just floats around when she uses her power. Next thing you'll be saying no one leaves lines when they move. ^That made my morning, Teemu. No but really, that comparison to the visualization of telekinesis in a movie really drives in the point and makes one appreciate the visual "cheatery" they use in comic books to combat the litimations of the necessary stillness of imagery. Applies to all movement obviously. Technically nothing would stop them from just having a character just point out a hand at an object that is currently being hovered telekinetically and be done with it, but it's like an extra layer of in-universe reality they choose to show us instead. It's... beautiful. It really is beautiful. And one of the things I really liked at the Dr. Strange movie is that they did give us some visual energy effects when various spells and whatnot would be used, instead of just showing the effect of the spell without the razzmatazz. I didn't see you mention this and I can't recall if it was for the regular series or just the Mini but Stephen Platt was originally going to do the Cable series (again - mini or regular series?) but moved to Image to work with Rob who strikes again on his former team taking the talent away. 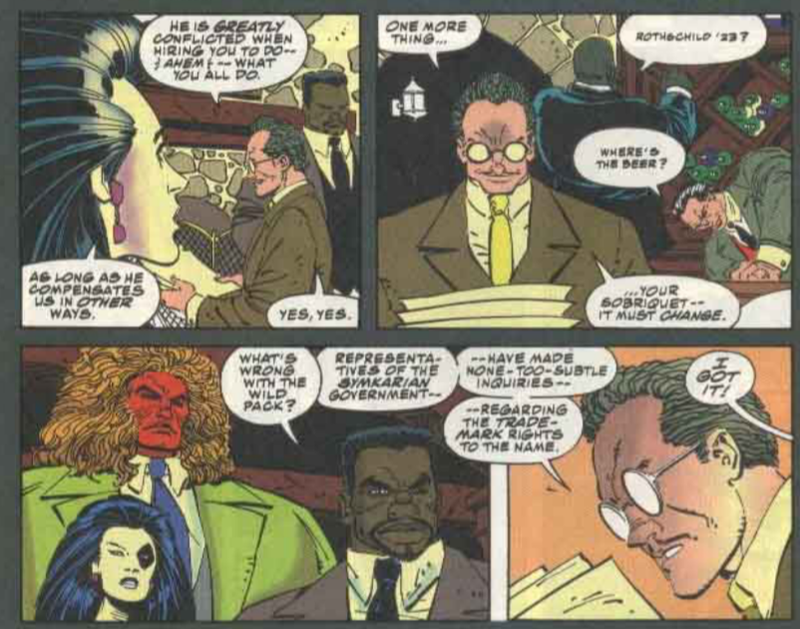 I love Stephen Platt and I wish he had stuck around Marvel and honed his skills instead of moving to Image, taking the freedom and money and not doing as much as he could have in the industry. If I remember right, Marvel had to scramble to get the series made because they were in late stages of getting Splatt to draw it. Splatts series Soul Saga never even finished releasing here in the US, you have to get a German version of the TPB that includes 5-6 together and even then, it doesn't look like he drew the full thing, someone else from his studio must have stepped in. He hasn't done a lot in the comics industry since that time, I believe he does Movie work. Doing a chronological search for Platt’s credits at the Grand Comics Database pretty well confirmed my memory that Platt didn’t quite make the scene in time for him to draw this mini, although it’s possible either that earlier credits are missing there or, (considerably) less likely, that he was hired to draw it before he had any other published work in the industry. Yeah, Platt left Marvel for Image after Moon Knight 60, which was published in 1994- he was definitely supposed to be the artist on the regular series, not the mini. The regular series was also plagued with lots of lateness problems, so that would track that they would have had to scramble to replace Platt. 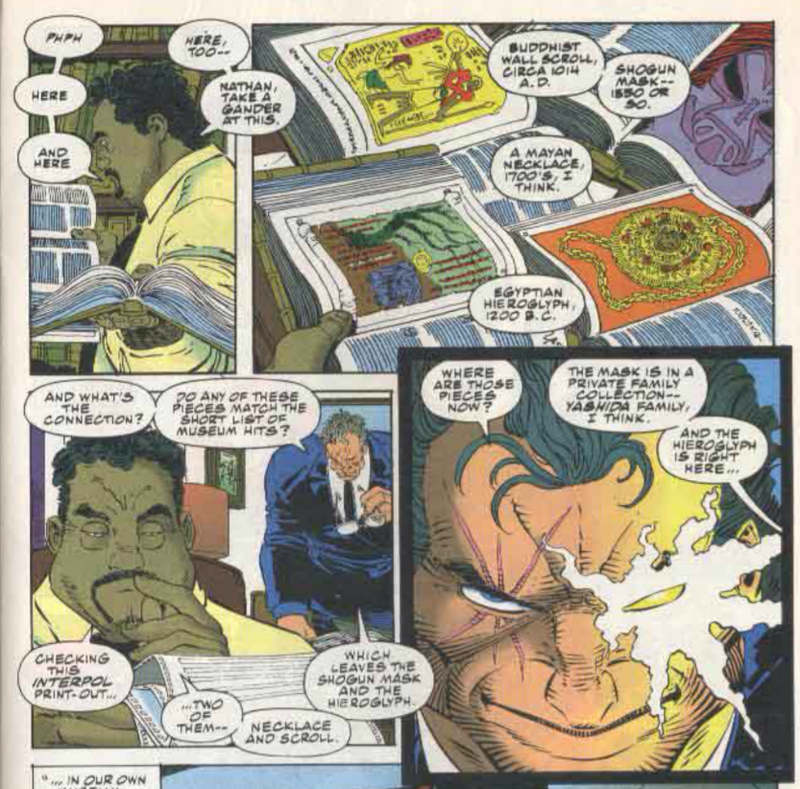 It also helps explain how Art Thibert ended up drawing those early issues of the series. I mean, he's a not a terrible artist, but I always associate him as a "solid fill-in" guy, capable of mimicking various styles (at that point, Jim Lee's), rather than someone you have drawing the initial issues of a high profile new series. I liked this miniseries a lot at the time, as it seemed like the X-Office was actually going to give us some answers about Cable and not tease out mysteries for years like they had with Wolverine. But then they still ended up dragging this stuff out too long. But at the time, I was really pleased with this. Thanks to JRJr., the storytelling is far more clear and direct than it was in "X-Force" at the time, so it also gave me hope that they were going to make it a priority to clean up the mess that Liefeld created and then left them with over the course of that series. Of course, then came "X-Cutioner's Song" to dash my hopes. But I did buy these two issues out of dollar bins a few years ago to re-read them, and I think they still hold up as a solid action series. I think this is one that has stood the test of time, at least for me. I don’t care much about any of this but, yeah, kudos to him for that, and to JRJr. for showing us what Liefeld’s designs look like in the hands of someone with the ability to compose a page and render anatomy, detail, etc. without skimping on the bombast. The indicia on both issues reads Cable — Blood and Metal rather than just Cable, by the way, for whatever it’s worth. And I enjoyed the head-shot inserts by different artists on the opening pages. +1 on the head-shots. Gives some gravitas to see those recognisable pics there that have been lifted from the previously read issues. +1 (or is it +2 now) on the headshots as well. And in hindsight, I probably should have titled these posts as "Cable: Blood & Metal", both because of the indicia and to make them distinct from the later issues of the ongoing series, but oh well.